You will be given a Free reference e-book to read which has 529 pages And the test will be based on that e-book. LEED which stands for Leadership in Energy and Environmental Design is mainly composed of a set containing rating systems primarily designed for the construction, design and administration of green homes, neighbourhoods and buildings that have a higher level of performance. It is mainly designed to offer building operators and owners with a more concise framework useful in implementing and identifying measurable and practical design, maintenance, operating and design solutions for buildings. Those who hold an LEED certification are capable of changing the manner through which established environments are being operated, designed and constructed. It also works in addressing the whole building lifecycle through its comprehensiveness and flexibility. It should also be noted that an LEED certification is capable of providing building operators and owners with all the tools that they need to improve the performance of a building while also ensuring that all its occupants enjoy a healthier and greener indoor space. 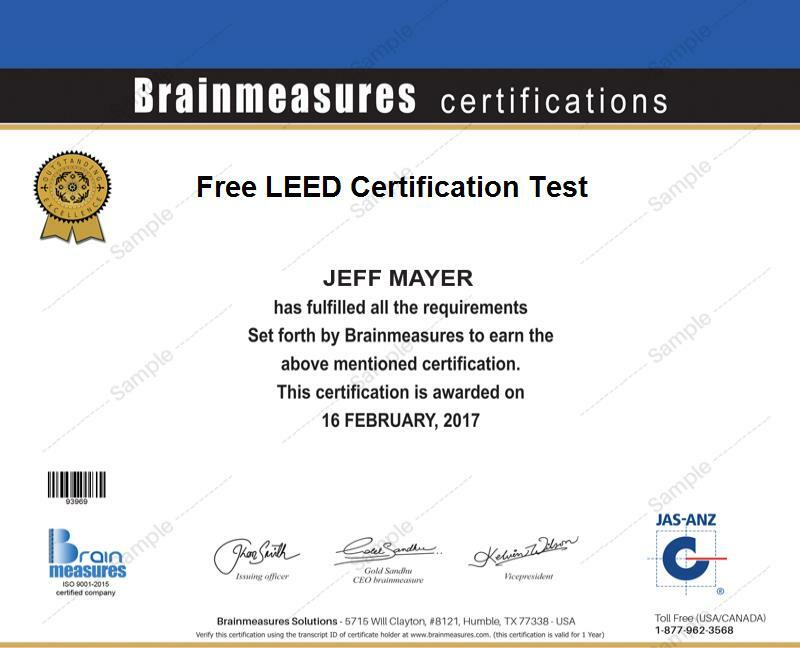 If you plan to pass the LEED certification exam, then be aware that Brainmeasures can help you out with the presence of its free LEED certification practice course. This free practice course continues to receive great reviews from the public because of the comprehensiveness of its free study guide and the accuracy of its free practice test which is a major help in allowing an aspiring LEED certification holder to prepare for it. With the help of this practice course developed by a popular and highly recommended online certification company, becoming a certified LEED expert will no longer become a problem. The free LEED certification practice course which is now available at Brainmeasures is your ticket towards generating a more comprehensive overview about Leadership in Energy and Environmental Design. It comes with a study material which contains all the things that you need to know about LEED and transform yourself into a more reliable expert in the field. It lets you understand everything about LEED, its scope, major functions and benefits and the specific roles and responsibilities that you need to fulfil if you are already a holder of its certificate. The free LEED practice test which also forms part of the course also works in boosting your chances of learning everything about the actual certification exam and the basics of developing a more effective strategy that will let you successfully pass it. The free LEED certification practice course developed and offered by Brainmeasures is extremely useful for all those who intend to take a hold of an LEED certification. It aims to provide more benefits to all practicing and aspiring property managers, contractors, building engineers, architects, designers and other professionals who want to focus more on accomplishing green building projects. Holding an LEED certification is also a major help in increasing the level of salary that you regularly receive. It gives you the opportunity to work as a LEED specialist and earn at least $66,000 on an annual basis. Deciding to use your certificate to work as a LEED consultant can also help you in earning an average salary of $87,000 every year.